The National Football League was on the clock. 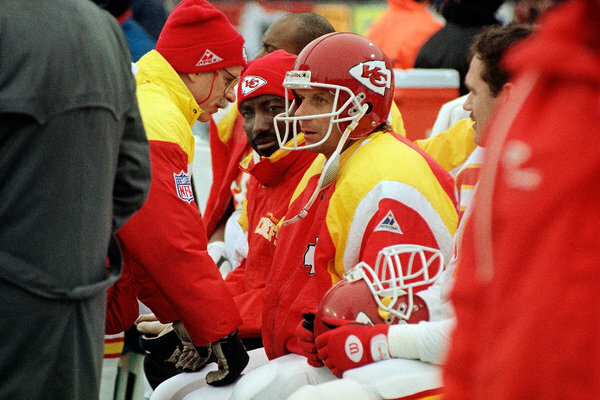 With several of its marquee players retiring early after a cascade of frightening concussions, the league formed a committee in 1994 that would ultimately issue a succession of research papers playing down the danger of head injuries. Amid criticism of the committee’s work, physicians brought in later to continue the research said the papers had relied on faulty analysis. Now, an investigation by The New York Times has found that the N.F.L.’s concussion research was far more flawed than previously known. For the last 13 years, the N.F.L. has stood by the research, which, the papers stated, was based on a full accounting of all concussions diagnosed by team physicians from 1996 through 2001. But confidential data obtained by The Times shows that more than 100 diagnosed concussions were omitted from the studies — including some severe injuries to stars like quarterbacks Steve Young and Troy Aikman. The committee then calculated the rates of concussions using the incomplete data, making them appear less frequent than they actually were. These discoveries raise new questions about the validity of the committee’s findings, published in 13 peer-reviewed articles and held up by the league as scientific evidence that brain injuries did not cause long-term harm to its players. It is also unclear why the omissions went unchallenged by league officials, by the epidemiologist whose job it was to ensure accurate data collection and by the editor of the medical journal that published the studies. In 2013, the N.F.L. agreed to a $765 million settlement of a lawsuit in which retired players accused league officials of covering up the risks of concussions. Some players have appealed the settlement, asking for an examination of the committee’s concussion research. Some retired players have likened the N.F.L.’s handling of its health crisis to that of the tobacco industry, which was notorious for using questionable science to play down the dangers of cigarettes. Concussions can hardly be equated with smoking, which kills 1,300 people a day in the United States, and The Times has found no direct evidence that the league took its strategy from Big Tobacco. But records show a long relationship between two businesses with little in common beyond the health risks associated with their products. Still, the records show that the two businesses shared lobbyists, lawyers and consultants. Personal correspondence underscored their friendships, including dinner invitations and a request for lobbying advice. In 1997, to provide legal oversight for the committee, the league assigned Dorothy C. Mitchell, a young lawyer who had earlier defended the Tobacco Institute, the industry trade group. She had earned the institute’s “highest praise” for her work. A co-owner of the Giants, Preston R. Tisch, also partly owned a leading cigarette company, Lorillard, and was a board member of both the Tobacco Institute and the Council for Tobacco Research, two entities that played a central role in misusing science to hide the risks of cigarettes. The N.F.L.’s concussion committee began publishing its findings in 2003 in the medical journal Neurosurgery. Although the database used in the studies contained numerical codes for teams and players, The Times decoded it by cross-referencing team schedules and public injury reports. The N.F.L.’s concussion studies have faced questions since they were published, but even the league’s harshest critics have never suggested, and no evidence has ever arisen, that the underlying data set could be so faulty. “One of the rules of science is that you need to have impeccable data collection procedures,” said Bill Barr, a neuropsychologist who once worked for the Jets and who has in the past criticized the committee’s work. By excluding so many concussions, Mr. Barr said, “You’re not doing science here; you are putting forth some idea that you already have"
In the mid-1990s, the National Football League formed a concussion committee that ultimately determined that head trauma posed no significant danger. But the data it collected from teams was inconsistent and contained glaring omissions — some involving the game’s star players. The 49ers have no concussions listed from 1997 through 2000. 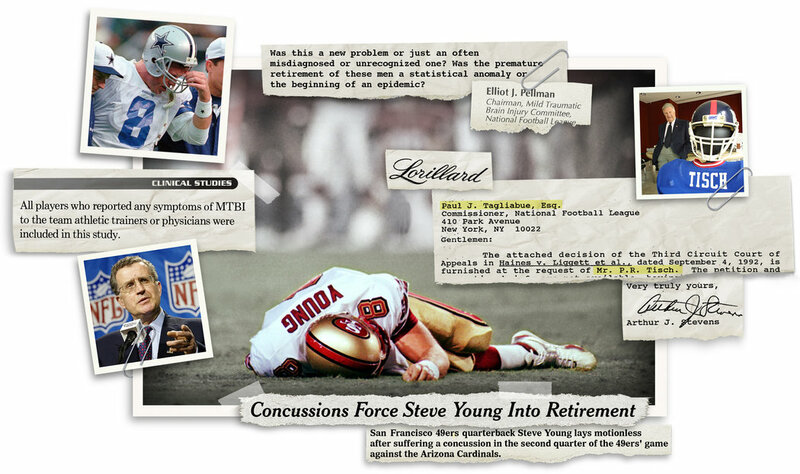 However, numerous media reports and the N.F.L.’s own injury reports indicate quarterback Steve Young had at least two. The one at left occurred against Arizona in 1999. Young did not play again. The Cowboys do not have a single concussion in the database, which covers six seasons. But according to media reports and the N.F.L.’s injury reports, quarterback Troy Aikman sustained four during that time, including one against the Eagles in 1997, left. *Sometimes injury reports refer to concussions as head injuries. News media outlets at the time reported that Cowboys officials had said Aikman sustained a "mild concussion." But after The Times described how it had identified missing concussions, the N.F.L. said this week that the studies, in fact, “never purported” to include all concussions. Teams were “not mandated” to participate, the league said, only “strongly encouraged.” And some teams, a spokesman said, “did not take the additional steps of supplying the initial and/or follow-up forms.” He did not explain why some teams had not included all concussions identified by medical personnel. The league explained, as did the papers, that some concussions went undiagnosed in the first place because players are known to occasionally hide their symptoms of concussion from team doctors; that symptoms of concussion can be so brief that no one notices; and that doctors might have used different criteria to make concussion diagnoses. But the vast majority of omitted concussions identified by The Times were included in the N.F.L.’s public injury reports, meaning that medical staffs had made the diagnoses and reported them to the league. Some of the omitted concussions were reported by the teams to the news media after a game but do not appear on the injury reports, presumably because the player’s status for the next game was not in doubt. The database does not include any concussions involving the Dallas Cowboys for all six seasons, including four to Mr. Aikman that were listed on the N.F.L.’s official midweek injury reports or were widely reported in the news media. He and many other players were therefore not included when the committee analyzed the frequency and lasting effects of multiple concussions. Several other teams have no concussions listed for years at a time. Yet the committee’s calculations did include hundreds of those teams’ games played during that period, which produced a lower overall concussion rate. A Cowboys spokesman, Rich Dalrymple, said the team had participated, but he declined to say how many cases were reported and which players were involved. He said he did not know why the Cowboys’ data did not appear in the studies. A San Francisco 49ers spokesman did not return messages seeking comment about Mr. Young. Some injuries were more severe than what was reflected in the official tally. According to committee records, St. Louis Rams quarterback Kurt Warner sustained a concussion on Dec. 24, 2000, that healed after two days. But Mr. Warner’s symptoms continued, and four weeks later he was ruled out of the Pro Bowl with what a league official described as lingering symptoms of that head injury. The N.F.L. declined to make Dr. Pellman available for an interview. The study’s epidemiologist, John Powell, who no longer works on behalf of the league, did not respond to interview requests. Michael L. J. Apuzzo, editor of Neurosurgery when the papers were published, did not respond to interview requests. Chronic traumatic encephalopathy, a degenerative brain disease, has been found in dozens of former N.F.L. players. Here are some of the most notable cases, along with New York Times coverage. The committee and the N.F.L. have long claimed that the papers were vetted through a rigorous, confidential peer-review process before publication, which legitimized their methods and conclusions. But more than a dozen pages of anonymous back-and-forth between reviewers and the committee show some reviewers almost desperate to stop the papers’ publication while the authors brushed aside criticism. In 1992, amid rising concerns about concussions, Mr. Tisch — the Giants and Lorillard part owner — asked the cigarette company’s general counsel, Arthur J. Stevens, to contact the N.F.L. commissioner at the time, Mr. Tagliabue, about certain legal issues. Mr. Stevens was not just any tobacco lawyer; he was a member of the industry’s secretive Committee of Counsel, which helped direct tobacco research projects. In a letter obtained by The Times, Mr. Stevens referred Mr. Tagliabue to two court cases alleging that the tobacco and asbestos industries had covered up the health risks of their products. In one case, the family of a dead smoker sought internal documents that the tobacco industry had withheld on the grounds of lawyer-client privilege — which does not apply if invoked to cover up a crime. The judge in the case reacted angrily after reading those internal records. “The documents speak for themselves in a voice filled with disdain for the consuming public and its health,” the judge, H. Lee Sarokin of Federal District Court in New Jersey, wrote earlier in 1992. Tobacco lawyers succeeded in having Judge Sarokin removed from the case. Why an influential tobacco lawyer would recommend legal cases to the N.F.L. is not known, because neither Mr. Stevens nor Mr. Tagliabue would agree to be interviewed. Mr. Tisch died in 2005. Even so, records show that, in the legal arena, the league and the tobacco industry sometimes intersected. Before joining the N.F.L., Ms. Mitchell, a young Harvard Law School graduate, had been one of five lawyers at Covington & Burling who had provided either lobbying help or legal representation to both the N.F.L. and the tobacco industry, sometimes in the same year. Mr. Tagliabue had been a partner at the firm before becoming the N.F.L.’s commissioner. In 1992, Ms. Mitchell defended the Tobacco Institute against a smoker’s lawsuit. She also worked on behalf of the institute in a landmark secondhand smoke case, as well as for other nontobacco clients. Ms. Mitchell said she was not responsible for legal strategy in the tobacco cases. At the N.F.L., said Brian McCarthy, a league spokesman, Ms. Mitchell’s work for the concussion committee was administrative. “She did not have any responsibility or any role in directing the research,” he said. Dr. Waeckerle, the concussion committee member, offered a different view. Dr. Waeckerle praised her for bringing a nonmedical voice that made members consider the risks, benefits and “what are the intended and nonintended consequences of whatever we were discussing.” He said, for example, that she wanted to ensure that the committee’s work applied only to the N.F.L., not to college or youth football. Ms. Mitchell said in an interview that she left the N.F.L. after six years for personal reasons, unrelated to her work, and that she did not recall much about the committee’s work. Ms. Mitchell added that, as the league’s assistant secretary, she had broad responsibilities beyond health and safety issues. On at least two occasions in the 1970s and 1980s, the N.F.L. hired a company whose client list included the Tobacco Institute to study player injuries. The league also hired a company — for a matter unrelated to player safety — that had performed a study for the tobacco industry that played down the danger of secondhand smoke. The N.F.L.’s ties to tobacco are reflected in other ways. When Congress was considering legislation that dealt with when a team owner could relocate a franchise, Joe Browne, a league official sought lobbying advice from a representative of the Tobacco Institute. “I would like to take the opportunity to sit down and discuss this bill with you further,” Mr. Browne said in a 1982 letter to the institute’s president, Sam Chilcote. Neil Austrian, a former N.F.L. president, had previously run an advertising agency that under his leadership reversed its ban on taking tobacco clients. He called Philip Morris “an honorable company that sets high standards.” It was during his tenure at the N.F.L. that the concussion committee was created. Years later, when the committee’s work drew criticism during the peer review process, its members pushed back. Andrew W. Lehren contributed reporting.